The first of two ALMA transporters -- unique vehicles designed to move high-tech radio-telescope antennas in the harsh, high-altitude environment of the Atacama Large Millimeter/submillimeter Array -- has been completed and passed its initial operational tests. The 130-ton machine moves on 28 wheels and will be able to transport a 115-ton antenna and set it down on a concrete pad within millimeters of a prescribed position. 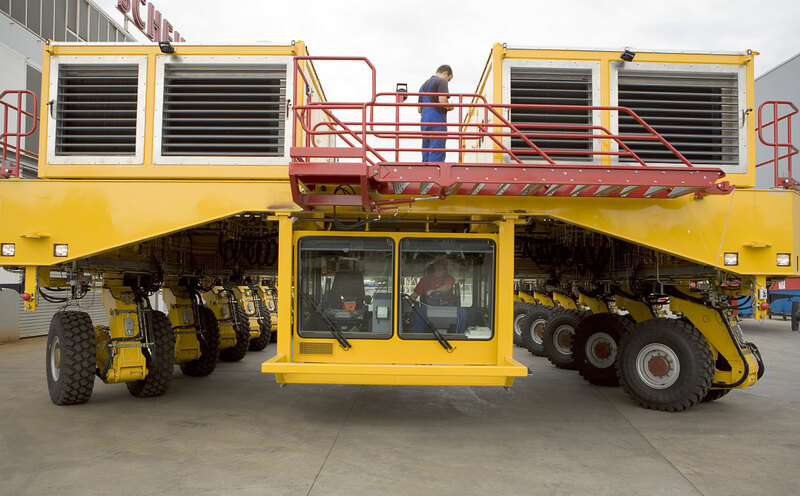 The ALMA transporter rolled out of its hangar and underwent the tests at the Scheuerle Fahrzeugfabrik company site near Nuremberg, Germany. The machine is scheduled for delivery at the ALMA site in Chile by the end of 2007, and a second vehicle will follow about three months later. ALMA is a giant, international observatory under construction in the Atacama Desert of northern Chile at an elevation of 16,500 feet. Using at least 66 high-precision antennas, with the possibility of increasing the number in the future, ALMA will provide astronomers with an unprecedented ability to explore the Universe as seen at wavelengths of a few millimeters to less than a millimeter. By moving the antennas from configurations as compact as 150 meters to as wide as 15 kilometers, the system will provide a zoom-lens ability for scientists. "The ability to move antennas to reconfigure the array is vital to fulfilling ALMA's scientific mission. The operations plan calls for moving antennas on a daily basis to provide the flexibility that will be such a big part of ALMA's scientific value. That's why the transporters are so important and why this is such a significant milestone," said Adrian Russell, North American Project Manager for ALMA. "The ALMA antennas will be assembled and their functionality will be verified at a base camp, located at an altitude of 2900 meters (9500 feet) and the transporters will in a first step bring the telescopes up to the 5000-meter (16,500 feet) high observatory," explained Hans Rykaczewski, the European ALMA Project Manager. "There, the transporters will move the antennas from the compact configuration to any extended configuration which could stretch up to 15 kilometers." To do their job for ALMA, the transporters will have to climb a 17-mile, high-altitude road with an average grade of 7 percent. Carrying an antenna, they can move about 7 mph; when empty, they can travel about 12 mph. The trip from the base camp to the high observing site will take about three hours. A special brake system allows them to safely make the downhill trip. The machines also incorporate a number of redundant safety devices to protect both the personnel and the valuable antennas. "In order to operate the transporter at the ALMA site, two engines with a total of about 1400 horsepower are installed and all the components have been checked to meet the requirements at this extreme conditions," says Andreas Kohler, Vice President for Research and Development at Scheuerle Fahrzeugfabrik, the company which built the transporters under contract to ESO. "The human factor was also considered. For example, the backrests of the driver seats are shaped to allow the driver to wear his oxygen tank while driving." At the high elevation of 16,500 feet, the transporter engines will only provide about half their rated power, because of the lowered amount of available oxygen. The ALMA project is a partnership between Europe, Japan and North America in cooperation with the Republic of Chile. ALMA is funded in Europe by ESO, in Japan by the National Institutes of Natural Sciences in cooperation with the Academia Sinica in Taiwan and in North America by the U.S. National Science Foundation in cooperation with the National Research Council of Canada. ALMA construction and operations are led on behalf of Europe by ESO, on behalf of Japan by the National Astronomical Observatory of Japan and on behalf of North America by the National Radio Astronomy Observatory, which is managed by Associated Universities, Inc.